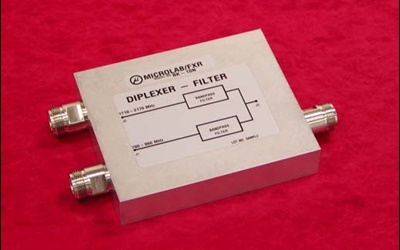 Announcing a new far smaller, pre-tuned Diplexer, designed to separate and combine low and high wireless frequency bands with only 0.2 dB loss. Pre-tuning eliminates the high cost of adjusting multiple cavities in conventional designs, while maintaining >50 dB isolation between bands, sufficient for most diplexer applications, such as sharing a common antenna or distributed antenna system. The new smaller size makes the unit far more suitable in Combiner Boxes. The low band extends from 700 to 960 MHz, incorporating proposed new bands being between 698 and 806 MHz. The high band, 1710 to 2170 MHz, includes all PCS, GSM-1800/1900 and the 3G UMTS frequencies ready for future upgrading. Passive InterModulation, PIM, is specified at <-150 dBc, and guarantees down to -160 dBc are available with an additional testing charge. Both arms have DC continuity and are rated up to 20W average power. This Diplexer, BK-10N, is available for immediate evaluation from Microlab/FXR and selected distributors. For complete details call 'Sales' at Microlab/FXR on (973) 386-9696 or check the Internet at www.microlab.fxr.com.